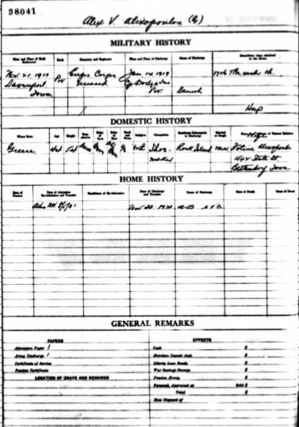 Ancestry.com has a database online that is titled - U.S. NATIONAL HOMES FOR DISABLED VOLUNTEER SOLDIERS, 1866-1938 which has 499 men who are listing Greece as their place of birth. This database contains records from twelve National Homes. The majority of the records consist of historical registers, but other records included in this database are indexes to the historical registers, applications, admissions, deaths, burials, and hospital records. Names and a few other pieces of information have been keyed only from the historical registers. Therefore, these are the only records that are searchable using the search template above. Images of all of the records (historical registers, indexes to the historical registers, applications, admissions, deaths, burials, and hospital records) can be viewed by using the browse table below. To learn more about National Homes, read the article Genealogy Notes: The National Home for Disabled Volunteer Soldiers by Trevor K. Plante, published in Prologue: Quarterly of the National Archives and Records Administration, Spring 2004, Vol. 36, No. 1 (available online at: http://www.archives.gov/publications/prologue/2004/spring/soldiers-home.html).